In December of 1914 its all change. Airey House is all about the war effect but the family are up in arms as one son goes off to fight in a way while the other claims to be needed on the estate. Poppy is greeted by an old teacher who tries to convince her to become a VAD nurse to help the war effort. There are reasons she does not want to join up, the first is love; leaving behind her true, forbidden love, might be the hardest thing she can think of. The second reason is the terrible effects of war. However when the family of Airey House choose to pack up for their country home and donate the house for use as a war hospital it seems Poppy’s mind is made up. She will become a VAD and as the lists of dead and wounded grow, she will help those in trouble while waiting for her own solider to come home. This book acts well as a social commentary on the effect war had on women in 1914 to 1916. How the war changed their roles, brought about a feeling of equality and independence for women is shown brilliantly in this book. But it also shows why things took so long to change properly following on from the war, how women had to wait another 10 years for the vote and why, even now there are social inequalities which we are battling against. Poppy reminds us how much of that it to do with the hierarchy in charge whilst telling a story of a brave young girl doing her part in a savage war, and I absolutely loved everything about it. The story is really about both the social changes and the love between Poppy and Freddie, the forbidden love that in her heart Poppy must know can never become anything. I found that aspect of the story interesting but only because it reflected the social ideals, I honestly thought Freddie was a bit of a tool! Poppy is a great character in her own right and I loved the relationship between her, the other nurses and VADs and the soldiers in her ward. I think the end of the book seemed a little rushed but I loved where it left off. I liked that there will be another book because whilst this didn’t finish one wrapped up nicely, I am not ready to let Poppy and the other characters go yet and there is a teaser for the next book right at the end. I really can’t wait for May 2015! Mary Hooper is one of my favourite authors and one of the main reasons my love for historical fiction has grown over recent years. I love her characters, her way of telling the story and the amount of research that obviously goes into the books she writes. Poppy is no exception and has come at just the right time as it is being published during the World War One centenary. I urge anyone wanting to read up more about the war and the efforts of women during the war to read this book, you will not be disappointed! 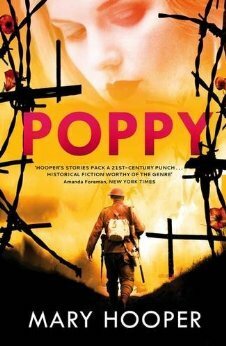 Poppy was published on May 8th by Bloomsbury. My copy was sent from the publisher in exchange for an honest review. I generally don’t like war-set stories, but I’ve really enjoyed what I’ve read by Mary Hooper so far. Maybe I should give it a go!